Note, Feb 10, 2018: I learned today, that Stephen Shepherd passed away on January 24th of this year. I didn’t know it when writing this post, or when restoring these saws. But maybe it had something to do with my sudden desire to work on this “distraction” from my cabin. You will be missed Stephen. In December of 2014, a very talented and generous member of the online woodworking community suffered a serious stroke which has kept him out of the shop and in full time care ever since. 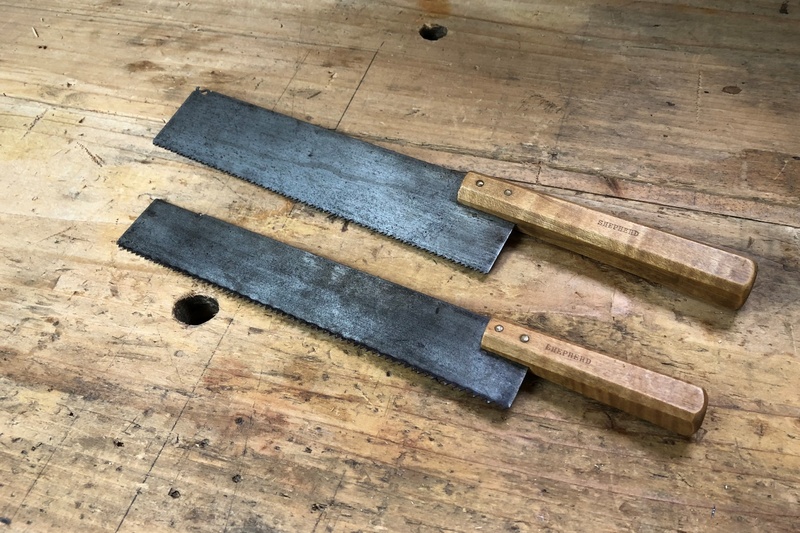 Stephen Shepherd was the proprietor of the Full Chisel Blog, author of several books on historical woodworking methods, and helped bring back to market some tools which had not been available since the mid 19th century. I had been a follower of Stephen’s blog since its very early days and had communicated with Stephen somewhat regularly through email and our two blogs over the years. While we have never had the chance to meet in person, being physically separated by almost an entire continent, I have always considered Stephen a friend. So it was very hard for me to hear of his unfortunate event. I was and continue to be very thankful that Stephen survived the ordeal at the time. But it is still sad to think that he will never put a tool to wood again. These saws were made by Stephen Shepherd from old, damaged, full sized hand saws. As such, they don’t require a brass or steel back to stiffen them. They are stiff enough to use without a back. In March of 2015, not long after hearing about Stephen’s condition, I had been browsing the big auction site for old tools, as I occasionally do. While perusing the listings, I stumbled across two auctions for hand saws that looked very familiar to me. The seller advertised them as “Shepherd” gentleman’s saws. When I inquired with the seller if they were a friend of Stephen’s, they simply replied that they did not know Stephen. 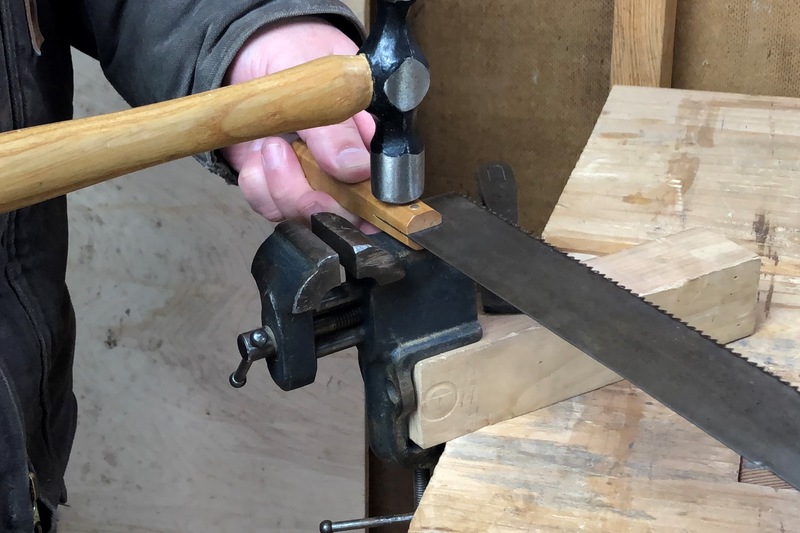 I didn’t ask where the seller obtained the saws from, but I did press the Buy It Now button on both auctions to ensure that the two siblings continued to stay together and do the work that they were so carefully crafted by Stephen’s hands to do. Stephen wrote about these two saws on his blog in April 2008. I left my normal sized machinist’s vise at our old house when we moved. So I use this mini clamp on model for the very little metal work I need to do. When I received the saws and looked them over, I realized that they needed a bit of work before they could be put back to use. So I put them away until I had more time to work on them. A few short months later, my family and I packed up and left New Jersey for the Blue Ridge Mountains of Virginia. As a result, these saws have been sitting in storage in my new shop ever since. I recently came across them while looking for something else and decided that I wouldn’t let them sit idle any longer. The first thing I did was tighten up the rivets that hold the handles on. The straight handles on these two saws are just held in place by a couple of brass pins peened over on each side to form rivets. To tighten up the handles, I just put one end of the rivet down on the back of a small machinist’s vise, and hit the other side of the rivet with a hammer to peen the brass a bit more, being careful to hit just the brass pin and not the tiger maple handle. A few taps on each rivet tightened things up nicely. I’ve been jointing with the 11″ regular taper saw file I use for sharpening my resawing frame saw because my flat mill file is dull. The teeth on the crosscut saw weren’t too bad. The saw was 10 points per inch, likely because that’s what the teeth were on the full sized saw that Stephen made this one from. I decided to leave them at this spacing for now and see how the saw works. I typically like my joinery saws to have somewhat smaller teeth than this, but I didn’t want to retooth both saws right now. The rip version had 8 PPI and really needed a lot more work. So I decided to remove all of the teeth from that one and recut them at 10 PPI like its sibling. If 10 PPI ends up being too coarse for the work I end up doing with these saws, I can always file off the teeth and retooth them finer. But I’ll use them this way for awhile first. Sharpening was a bit weird. I’m not used to saws this small having blades so thick. After the crosscut saw was jointed and the rip retoothed, all that was left to do was file the fleam into the crosscut saw and set the rip saw. I ended up deciding not to add any set to the crosscut saw. Because the saw was made from an old full sized hand saw, the blade had some of the taper grind from the original saw. I put a caliper on the toothline and the back edge and there was a difference of about 0.01″. I made a few test cuts and the saw didn’t bind up, so I’m going to use it without any set for awhile and see how it goes. After sharpening, the saws cut straight and clean. Due to the thickness of the blades, I didn’t notice any disadvantage to the saws not having backs. Time will tell if I prefer them to backed saws or not. But for now, they’re going into my period tools chest, and will get used when I do demonstrations, or decide to go old school on a build and just use old tools. I’m happy to have been able to rescue these saws and give them a proper second home. Stephen’s famous touchmark and tiger maple handles. Both were a signature feature of the many tools and handles he made. Posted in Hand Saws, Sharpening and tagged retoothing a hand saw, Stephen Shepherd. What a great story, Bob. They have found a home that will appreciate them. It is interesting that you mentioned the lack of a back on the saws. As you know, Japanese saws can use a very thin blade since the blade is kept in tension due to the fact that they saw on the pull stroke. On the other hand, sharpening a Japanese saw requires quite a bit more practice and skill than a western tooth form. 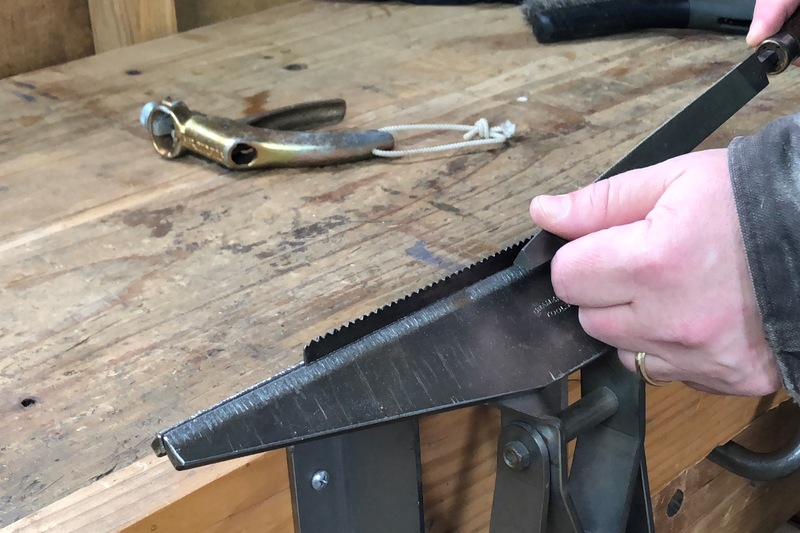 I have been meaning to try making saws that look like Mr. Shepherds, and with a western tooth form but with the teeth oriented to operate on the pull stroke. Have you ever tried this? Also, in one of your podcasts, you mentioned a few of Mr. Shepherd’s books. Do you know if the Full Chisel store is still operational? 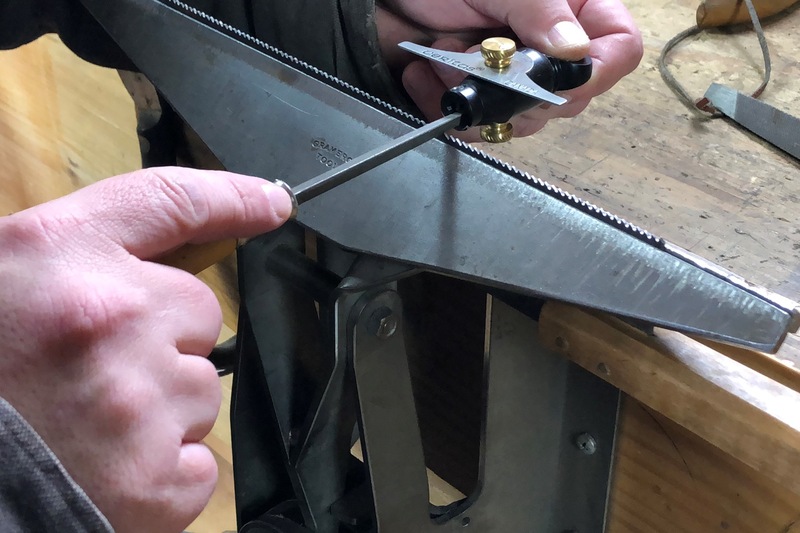 Well, I haven’t tried a saw like Stephen’s on the pull stroke, but I sometimes have my coping saw set up to cut on the pull stroke and it works just fine. There’s really not as much difference between western and Japanese saws as is sometimes stated. They’re actually more similar than they are different. So a pull saw with western teeth should work just fine. As for the Full Chisel Store still being operational, the last I heard, orders were still being fulfilled by Stephen’s nephew in order to keep the store running. That was some time ago though. I’d probably send an email to the store before checking out through them. I know Joel at Tools for Working Wood was carrying his books too. So you might check there as well. Great story, looks like another tool worth making. Still being new to using hand tools, I’m wondering what’s the advantage of these over short panel saws with typical western handles? No advantage really. Just a different style. Out of curiosity, what did your calipers read as the thickness of the saw plate? I want to say about 0.035” at the teeth and a bit more than 0.025” at the back. I have only a dial caliper though. No digital caliper and no micrometer. So 0.01” difference is really a rounded off guesstimate. George Bernard Shaw once said that his greatest friendships were all sustained by Post. You should feel very lucky indeed that you both had a relationship that endured by e-mail and Blog. Hi Bob. 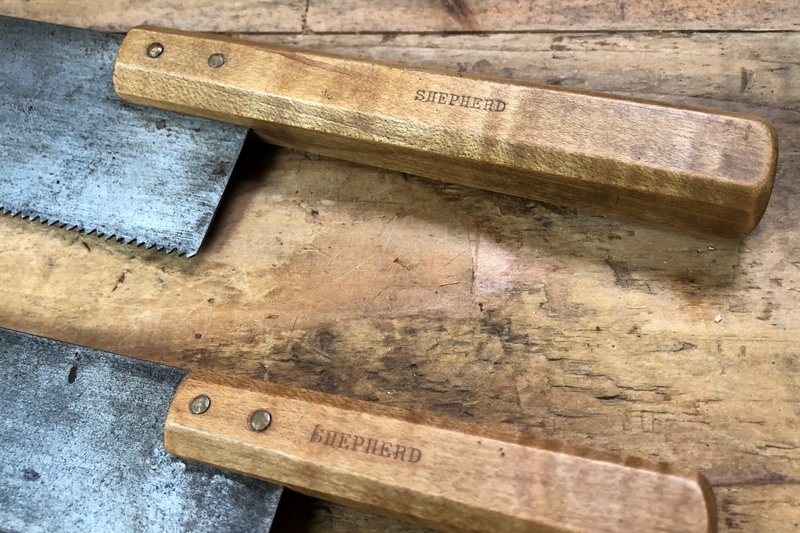 A few weeks ago you kindly answered my question about using raw linseed oil and I immediately tried ordering Mr. Shepherd’s book that you referred to from the fullchisel website with no success. Thought it was because I’m not in the US. After reading this I am doubly saddened. Glad to hear TFWW carries his books and will look there. So sorry for your great loss.